Happy Friday! I’m burning some midnight oil to get these fitting room reviews done but I hope this helps with your online purchasing decisions at LOFT. 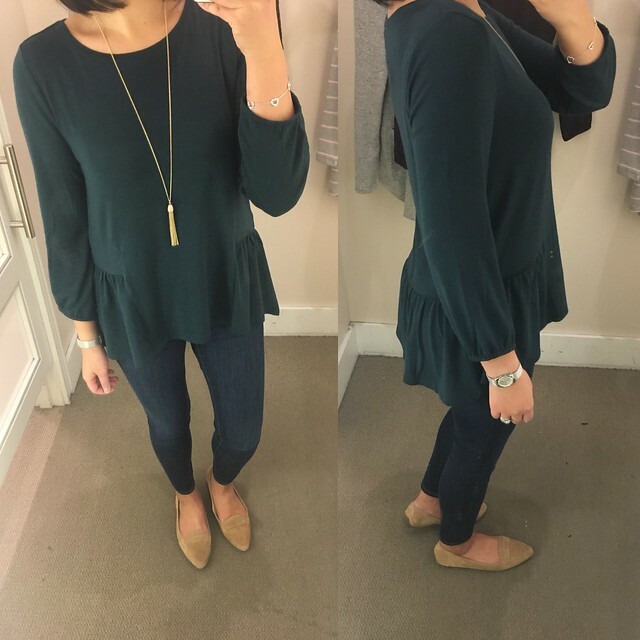 This relaxed peplum top is now on sale and an extra 50% off making it only $22.49! I really like the deep sea teal color and I tried on size XS regular the other day but I ordered it in XXS regular for a better fit. 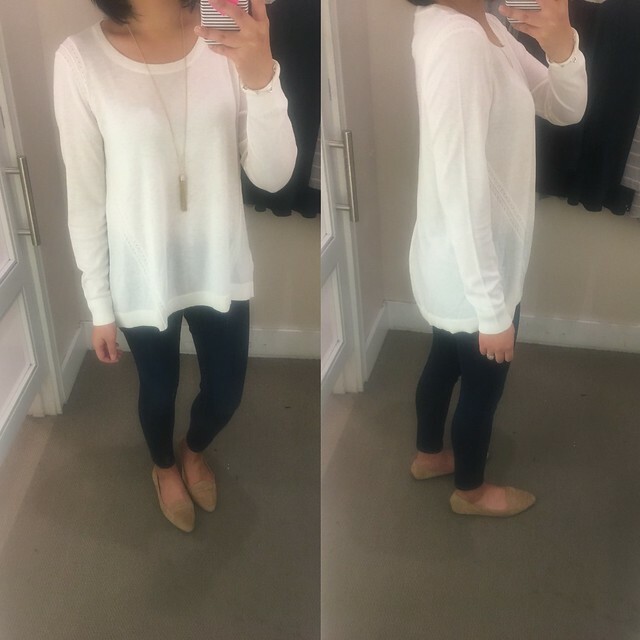 This top does have a very relaxed, loose fit. If you want a more fitted look then size down but I am confident my usual size will drape perfectly. I love this speckled shirttail open cardigan and I purchased it last week when it was 50% off. The material isn’t tissue thin so the collar drapes well. The sleeves of size XS regular are long on me but I wear mine folded up. I am also coveting the striped version which I may order in SP the next time it goes on sale. I love it paired with the white sweater pictured below which I have in the dark brown (deep olive vine) color (review here). 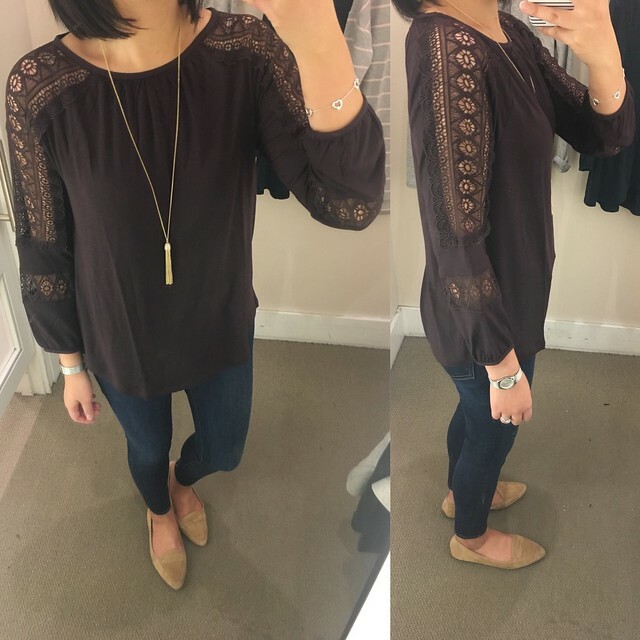 The gorgeous lace details on the sleeves of this blouse caught my eye and I tried it on for size. 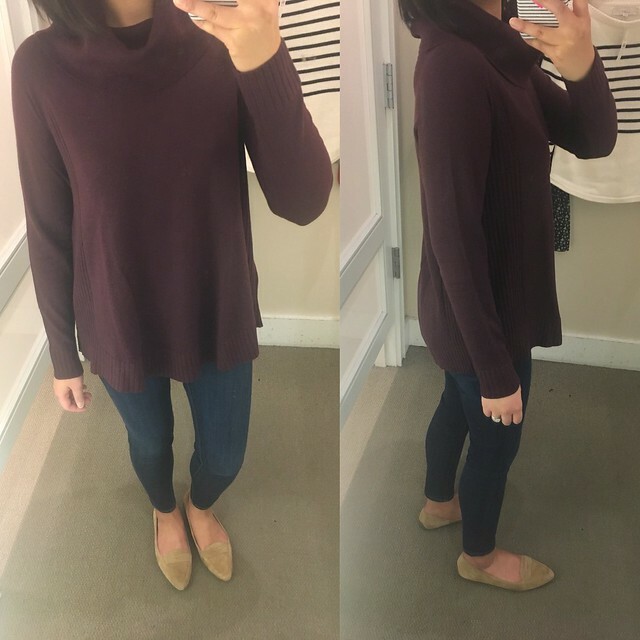 I found that it fits true to size for a relaxed fit throughout the sleeves and body. If you want a more fitted look then you can go down one size. I love the light pink stripes against the light grey of this tunic top but I found that size XS regular is too long on me (I’m 5′ 2 1/2″). It comes in petites so I plan to order it in size SP since I prefer a relaxed fit (versus a figure hugging fit) and I don’t like the sleeves to be too snug. 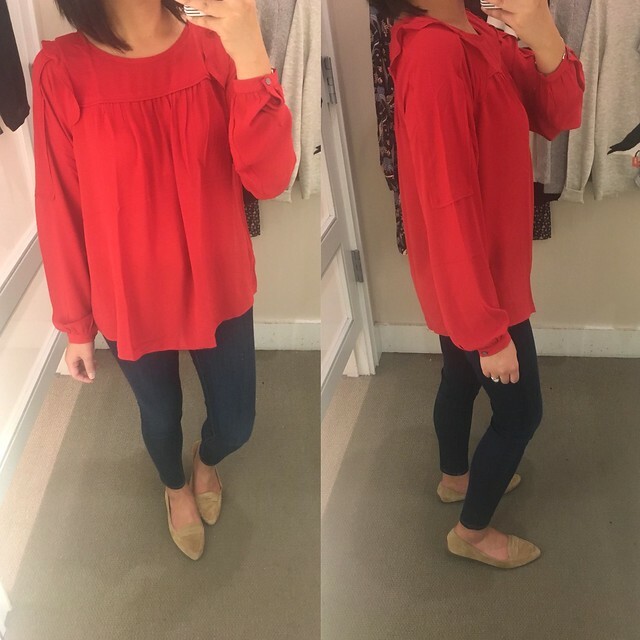 I love the simple and feminine ruffle detail of this blouse and while I liked both colors I got it in the red color for the holidays since I already have a similar style top in black. I went with size XS regular since I wanted it right away in store but I’m sure my usual size XXS regular would have fit very similar/slightly better. I’d say this top fits true to size. 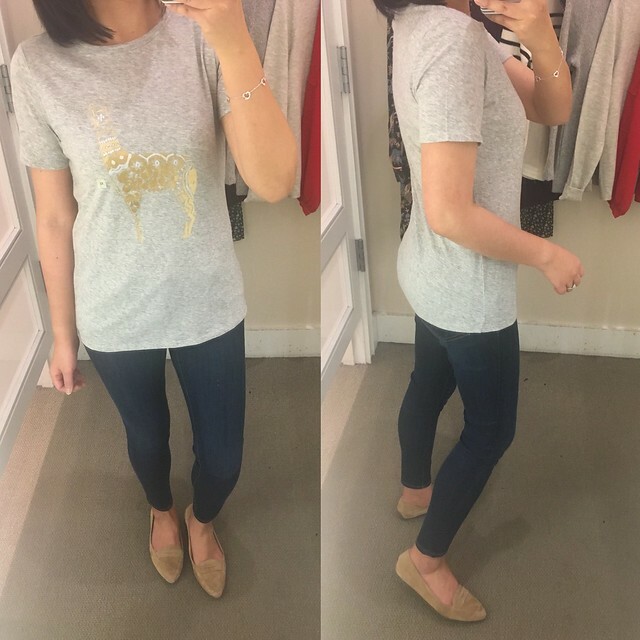 This simple but cute gold metallic llama tee looks just as cute in person. The tee isn’t too short and it has a relaxed fit. I found that it fits true to size. If you love animal motif sweaters, Su shared this llama sweater that is just darling! 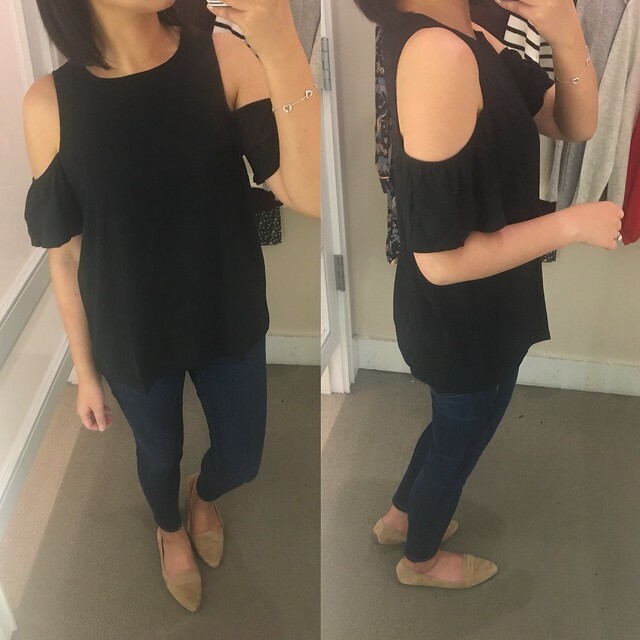 I’m slacking on my LOFT homework lately due to work and other commitments so Su also shared this cold shoulder blouse when we were chatting about LOFT new arrivals. The thicker straps help to hide my bra straps and the regular missy sizing is actually petite friendly. Size S regular was too loose on me so I believe size XS regular should fit me perfectly. 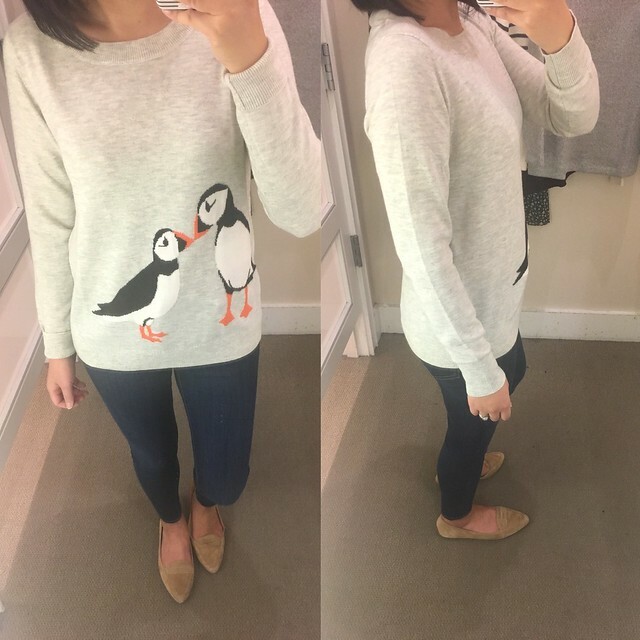 This puffin sweater is so cute that it was flying off the tables in store. I could only try on size S regular which actually fit me pretty well. I prefer a relaxed fit so I like how size S looks on me but the sleeves are slightly long which is easily remedied by folding them or pushing them up. 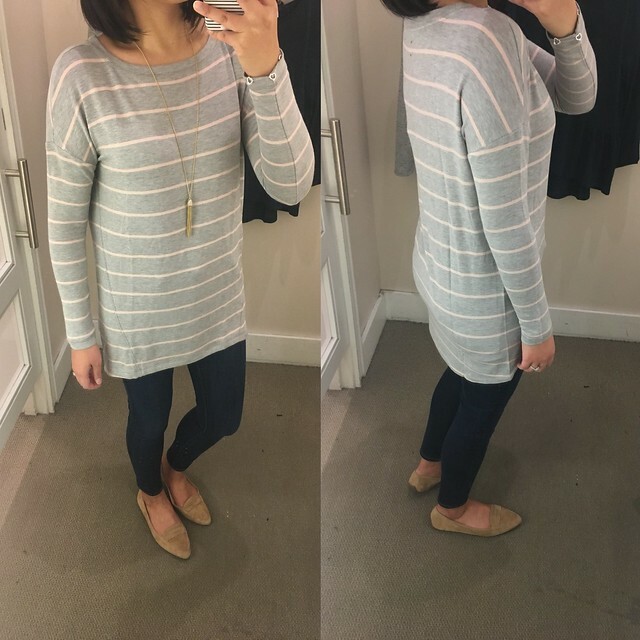 I’d say this sweater fits true to size but you may want to size up for a more relaxed fit. I also like this reindeer print sweater. 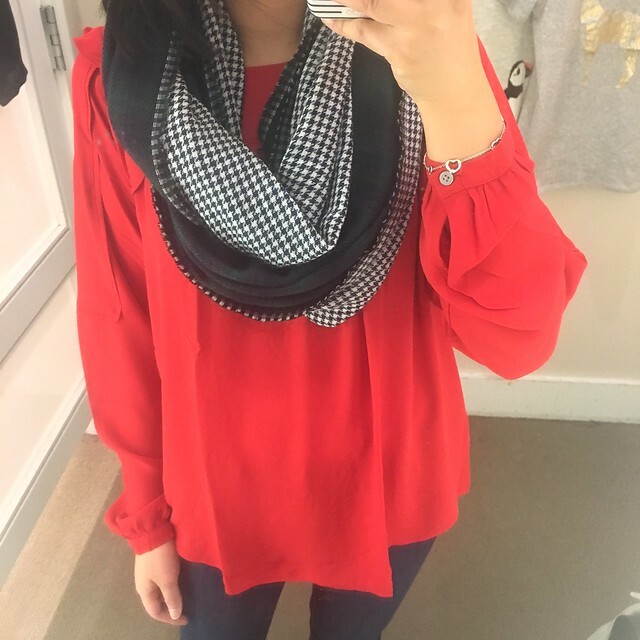 I picked up this mixed plaid infinity scarf and I love the plaid against the mini houndstooth print. Depending on how you drape it you can have both prints exposed or as shown below. 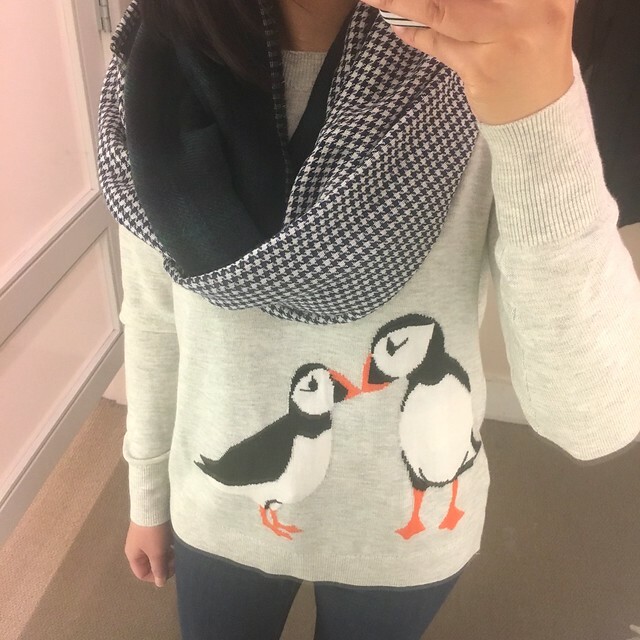 Alternatively, you can wear each print by itself if you carefully fold the scarf before you drape it in order to expose the preferred print on the outside. 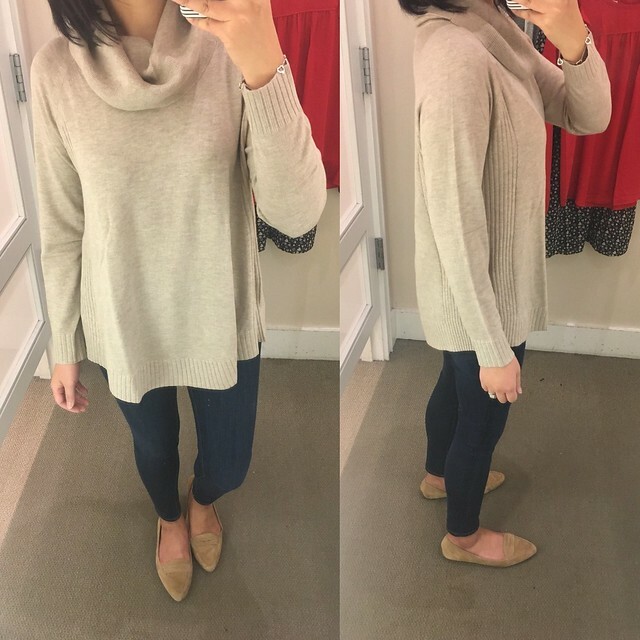 This cowl tunic sweater is another popular item that is selling out of many sizes at my local LOFT. I need size XSP but I only found size SP to try on in store. The ripened plum (above) and the muted mocha melange (below) are my favorite colors. It has a relaxed fit through the body so if you prefer a more fitted look then I would go down a size. 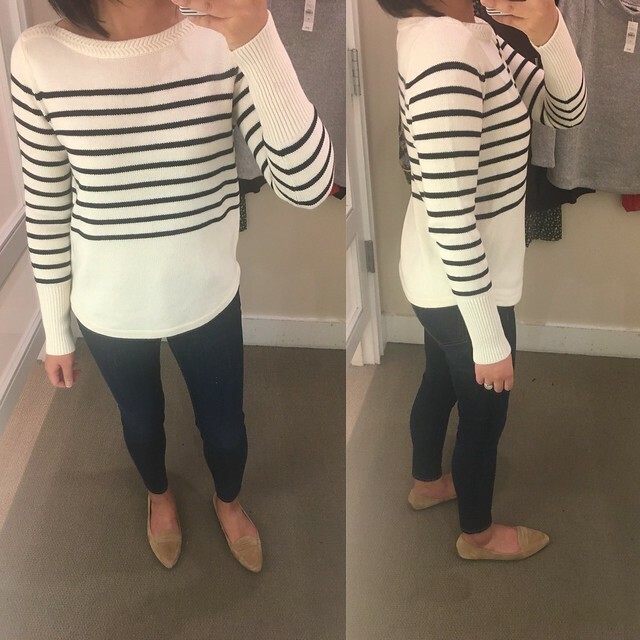 I really wanted to like this classic striped boatneck sweater but the material doesn’t have much give and the sleeves are snug. 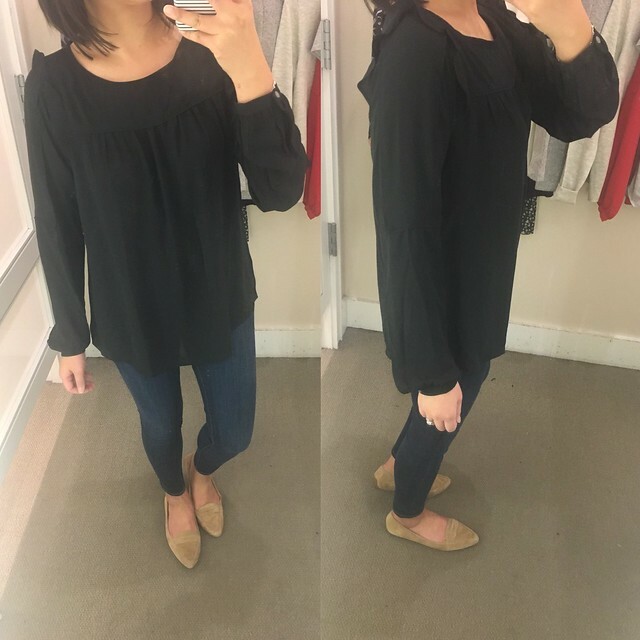 I sized up to S regular and the sleeves were somewhat comfortable but they are a little long. I may try on M regular in another visit but I passed on it for now. The sweater has a more cropped fit so if you’re tall then it may be too short for your torso. 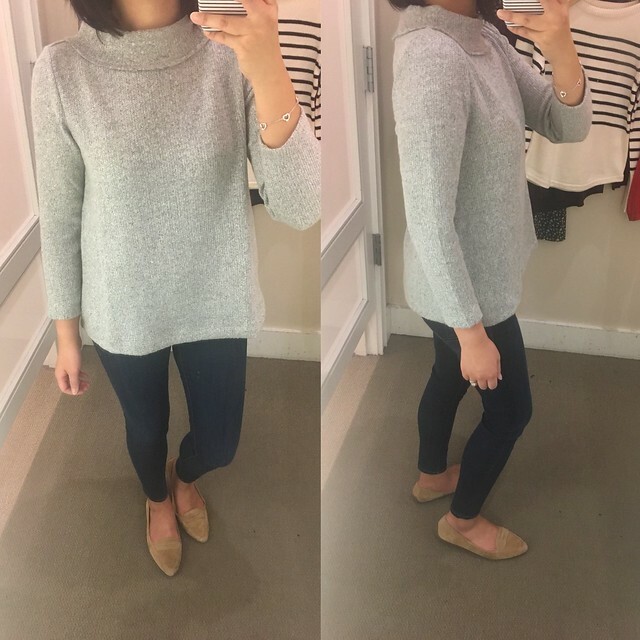 I don’t need another grey sweater like I need another hole in my head but I loved the feel of this soft mockneck swing sweater. It’s like wearing a super soft, cozy cloud against your body. 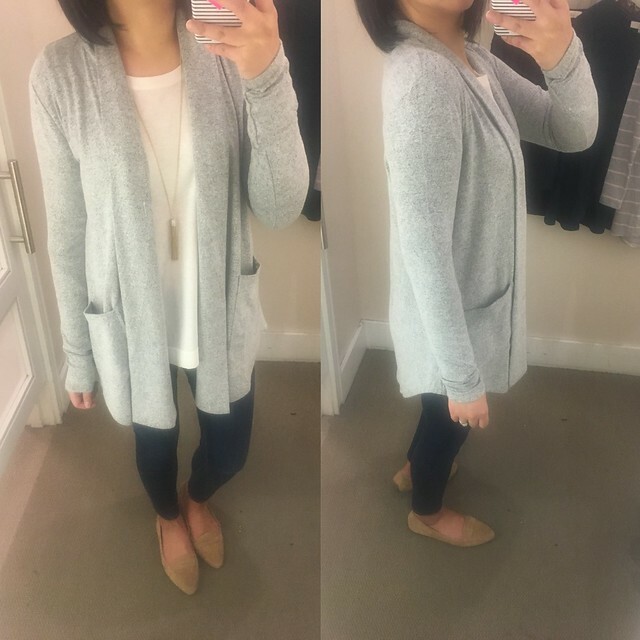 I found the regular missy size to be a petite friendly length and I was pleased with the fit of size XS regular. If fits true to size. The sales associate informed me that someone had just returned this heart print dress that morning. I remember looking at it online but then I forgot about it when I was culling items from my shopping cart. It’s currently full price online but I got it in store the other day for an extra 40% off and I used my Ann Cares card for an extra 25% off my entire in store purchase. 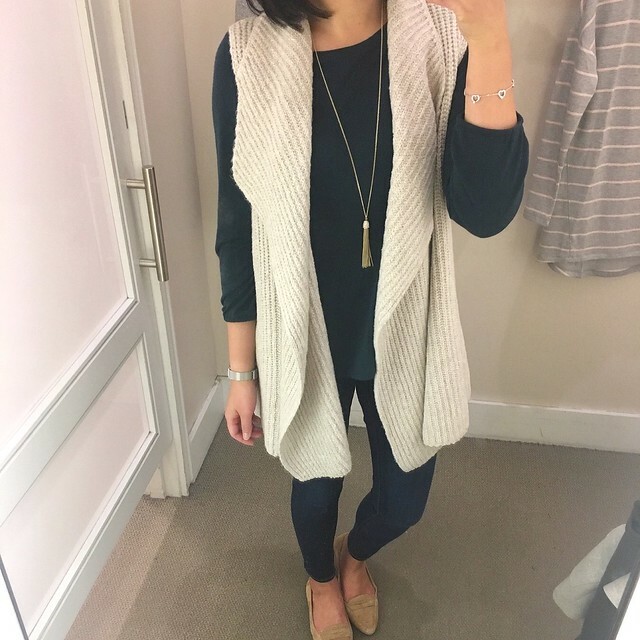 I plan to pair it with my ribbed sweater vest (review here) and either tall boots or booties. 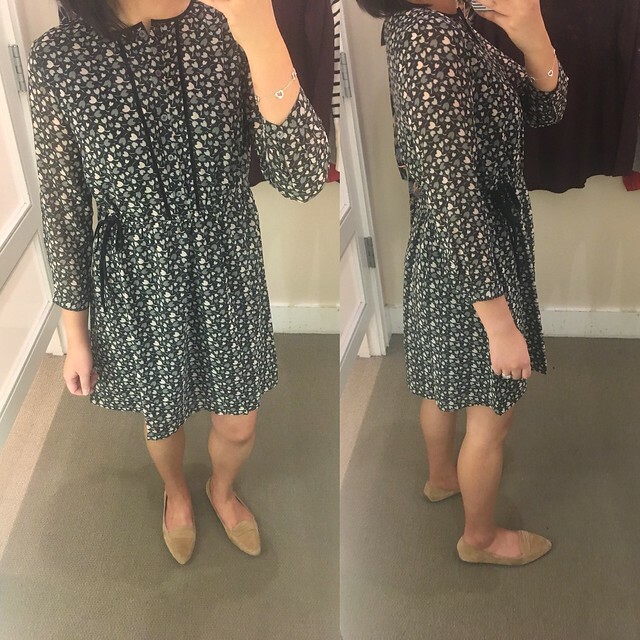 Lastly, I tried on this snowbird shirtdress in size 0P. I found that it fits true to size. 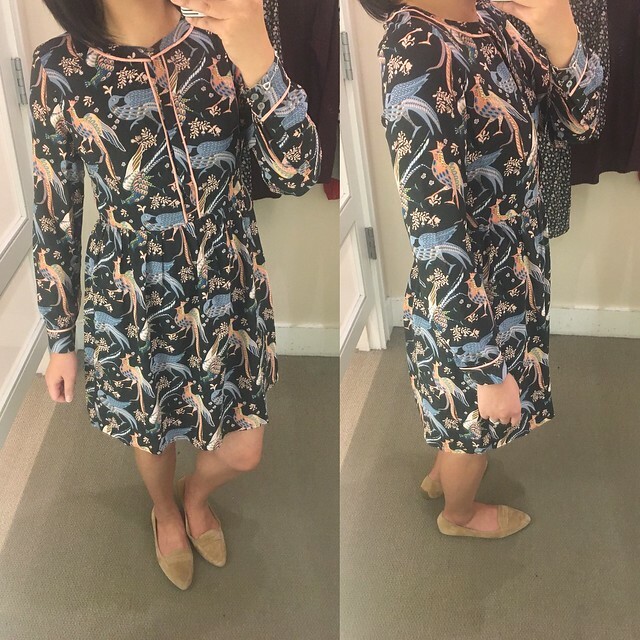 If you’re until whimsical bird prints then you may want to give this dress (also available as a utility blouse) a try.